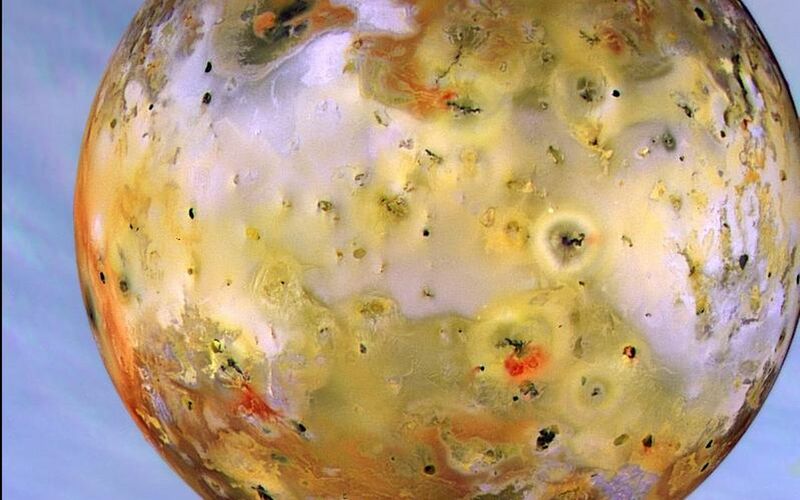 Io, the most volcanic body in the solar system, is seen in front of Jupiter's cloudy atmosphere in this image from NASA's Galileo spacecraft, now orbiting the giant planet. This newly [sic] processed image is the best and highest resolution view of Io produced thus far by Galileo. Galileo was about 487,000 kilometers (about 302,000 miles) from Io when this was taken on September 7, 1996, and Jupiter was about 908,000 kilometers (about 564,000 miles) away. 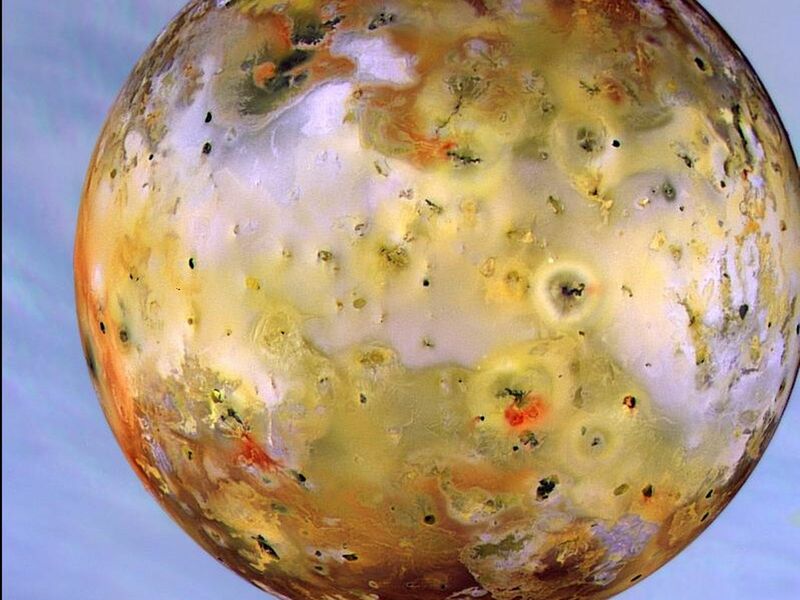 The image is centered on the side of Io that always faces away from Jupiter. 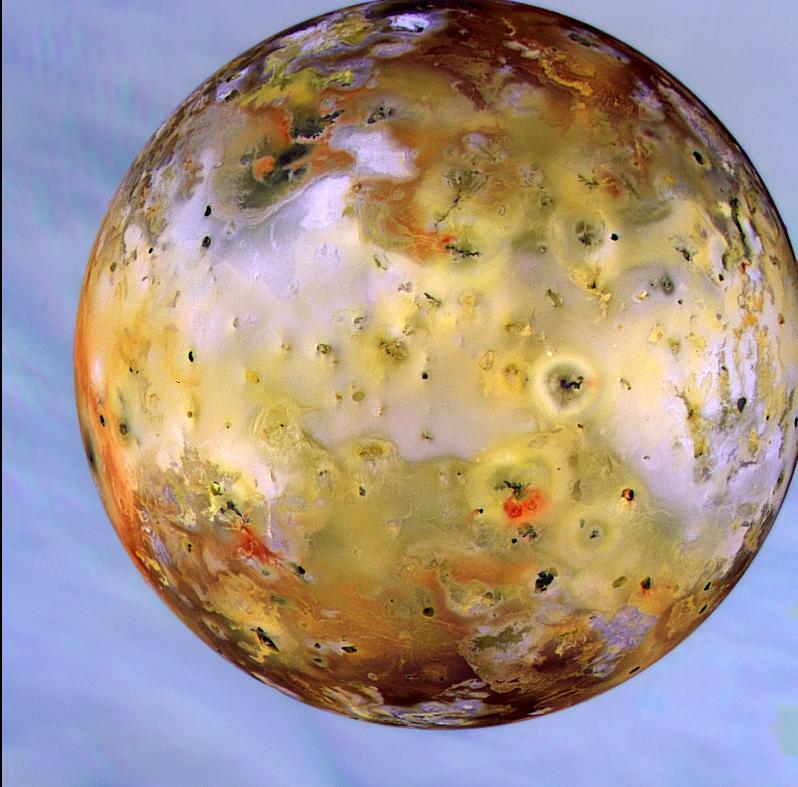 The color in the image is composed of data taken in the near-infrared, green and violet filters of Galileo's solid-state imaging camera, and has been enhanced to emphasize the extraordinary variations in color and brightness that characterize Io's volcano-pocked face. The black and bright red materials correspond to the most recent volcanic deposits, probably no more than a few years old. The near-infrared filter makes Jupiter's atmosphere look blue. The active volcano Prometheus is seen near the right-center of the disk. Scientists are noting many changes that have occurred on Io's surface since the Voyager flybys 17 years ago, and even a few changes in the two months since Galileo's imaging of Io this summer.